The Wichita Bicycle Master Plan is tentatively scheduled for presentation to the Wichita City Council on January 15th. The presentation will provide Council Members an opportunity to learn more about the Plan, ask questions, receive public input, and take action. The council is also scheduled to consider an ordinance to create a Wichita Bicycle and Pedestrian Advisory Board. In Dodge City, the City Commission is considering adding trail signage to the hiking and biking trails at the city lake. Iowa City, IA: Motorist Intentionally Collides with Bicyclist, Attempts to Flee Scene — “An Iowa City man is accused of intentionally turning his vehicle into a bicycle rider’s path and threatening the felled rider before initially trying to drive away before being warned to stay by a witness.” The driver is facing misdemeanor charges of assault with a dangerous weapon (vehicle) and attempting to leave the scene of an accident, in an October road rage incident. 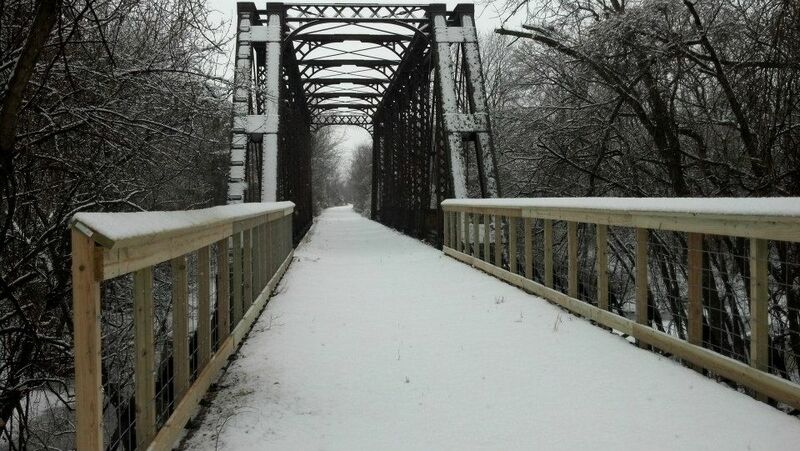 Boonville, MO: City of Boonville takes ownership of MKT Bridge — The historic Katy Bridge, which for many years had been threatened with demolition, was transfered from Union Pacific to the City of Boonville. The city plans to rehabilitate the bridge, which hasn’t been used since 1986, into a bicycle and pedestrian bridge on the Katy Trail, and intends to keep the lift span operational. The Katy Trail currently bypasses the old bridge, crossing the Missouri River on an unattractive and unpleasant highway bridge. McAlester, OK: The city is considering applying for a grant to help pay for a bridge on the proposed Belmont Trail, in south McAlester, part of proposed link of pedestrian and bicycle trails in the community. Currently, the bridge is not compliant with the American with Disabilities Act, but the plan calls for it to be replaced with a new structure designed to meet ADA standards. In addition to bicycles and pedestrian traffic, such as walkers and runnes, the trail could also be used by those on skate boards, roller blades and mountain bikes. Sunday, January 13 is the “Old Forest” race in the 2012-13 Blanket Series. It takes place in Great Bend. The last two races in the series are “Jeffs Flat Track” on January 27 (not sure where) and “River Trail” in Great Bend on February 10th. The Blanket Series is a low-key, grass-roots type of mountain bike event, where each racer brings a $10 gift, and after the race each rider will choose a prize from the blanket in the order of their finish. The series is sponsored by Golden Belt Bicycle in Great Bend. Unfortunately, the info on their web site is far out of date. Contact them by phone (1-800-561-2453) if you need more information or directions to the races. The Sunflower Cycling News is a periodic publication of Kansas Cyclist, featuring bicycling news from Kansas and neighboring states. I love the new Sunflower Cycling News!! Thanks so much for putting it together. Thanks, guys. Glad that folks are finding the digests useful. The posts are not too labor intensive, so hopefully I’ll be able to keep up!